Cops love famous teenagers! 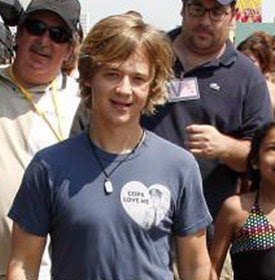 Here's a pic of Jason Earles, who apparently plays Hannah Montana's brother on the wildly popular American television series. I wonder if he knows we now offer that shirt in a long sleeve version? Got some pics of you or your friends wearing VV? Send em to us! Even if you're not related to Disney Channel royalty. Jason Earls is 32, he's not a teenager.